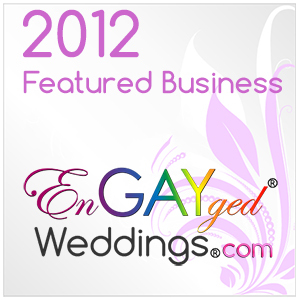 The below badges are for use ONLY by wedding vendors that are listed on the EnGAYged Weddings directory. Please note that the words EnGAYged and EnGAYged Weddings are internationally registered trademarks which we do enforce. To save a badge to your computer hover over the image with your mouse, right click and then click save image as. Feel free to re-size for your purposes. If you need a logo for print or have questions please contact us and we'll be happy to help. A backlink to https://www.engaygedweddings.com or to your advertisement on our directory is appreciated.